The Mattingly depicted here has the unusual "Trombone" type forks. 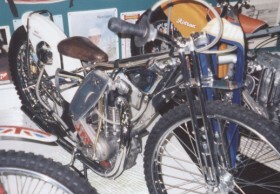 The earlier "Huck Fynn" machine also used similar type forks and were indeed invented by Huck Fynn. On the Mattingley bike the trombone forks are more modern and the fork legs are connected by 2 plates which are casting pieces whereas the earlier Huck Finn forks were welded. 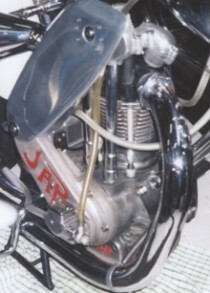 This particular machine also houses the JAP type 4A motor with its all-finned barrel.